Henri-Georges Clouzot saw potential in tucked-away places. His most celebrated films, The Wages of Fear (1953) and Diabolique (1955), are set in an isolated South American village and a rural French private school, respectively. His early work, Le Corbeau (1942), is in a French village noteworthy for its distance from urban bustle. Les Espions takes this to an extreme. It places its characters, and us, in an asylum. 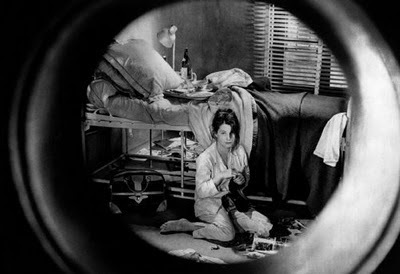 The asylum is occupied by only four individuals when the film begins: its resident physician and owner, Dr. Malic (Gérard Séty); an elderly nurse; a bedridden man in treatment for alcoholism, and Lucie (Véra Clouzot), a childlike mute who hears everything. Dr. Malic, we feel, has gone to seed. Single, childless, in need of funds, with little work to do and no one to talk to in the asylum save his grouchy assistant, he visits the local pub a bit too early in the day for professional propriety. One day he meets a man named Henderson; an American who drinks with him and offers him a ludicrous deal: five million francs to house a secret agent in his facility for just a few days, hiding him from foreign spies and agents and assassins. One million upfront, even—Henderson produces a wad of bills from his pocket. The men drink and talk, repairing to the bathroom to finalize the details. Henderson is as candid with Malic as he’s able to be. There will be many visitors, he warns the doctor: agents affiliated with Henderson, who will drop in to assess the situation; and agents working for others, too, trying to get to the agent, codenamed “Alex.” Malic will not know who is who. Malic, flush with cash, accepts these terms. Perhaps Malic is an idiot. This certainly occurred to me. Ignoring the weirdness of the deal—which no one sober enough to walk could be content with—there is Malic’s behavior upon returning to the asylum. He stumbles through the doorway, and in response to the nurse’s scolding, flashes his wad of bills. “I’m not allowed to say anything,” he tells her, after Henderson urged him to secrecy. Maybe I’m not being charitable here. Maybe this is simply a man so relieved to have the money he needs, to do the work that matters to him, that he ignores all else? His concern for Lucie seems real enough. But I don’t think that’s it either. I think Malic hides away in his asylum, alone with his thoughts, his measure of authority and no women, save an old one and a crazy one, because it is there that he can be free to be himself. His trip to the bar, where he meets a strange, dark-haired man over drinks, promising adventure and maybe, exhilaration, seems like the kind of thing Malic really wants. “Nothing illegal…or degrading,” Henderson promises him. It’s so much easier to believe things when you want them to be true. Soon Malic doesn’t know what to believe. His institution—supposedly difficult to enter or exit—becomes porous, with blatantly suspicious persons showing up unannounced and asking him questions. Among them are Kaminsky (Peter Ustinov); a menacing man who looks like a math teacher; and Cooper (Sam Jaffe); possibly an American spy, possibly a friend of Henderson’s, and far more sinister than the intellectual he played in my favorite sci-fi film, The Day the Earth Stood Still. Malic’s employees are suddenly replaced. The elderly nurse, whom we’d presumed would act as the voice of reason throughout the picture, is the first to go. When “Alex” finally arrives, well after others already have, he turns out to be a grim, secretive German who wears sunglasses even in the dark. Curd Jürgens, as Alex, delivers a key speech in the middle of Les Espions; one so world-weary that we’re tempted to take it at face-value. He laments the life of a spy; one in which a man must be constantly on guard, and cannot enjoy the luxury of believing anyone loves him for who he is, rather than what he can offer. Alex implies a community of such lost people—indeed, so does Clouzot, as the spies in the asylum, and later, in the pub, seem to know each other and commiserate. And Alex points out, perhaps as a warning to the naïve Malic, that information is everything—that spies trade in it and trade up for ever greater knowledge, to get ahead and indeed, to justify their continued existence. And so, in the end, it doesn’t matter who they work for, or even if they themselves know who, just so long as they have some piece of information to pass along. It is the same moral no-man’s-land occupied by men like the Enron traders, so consumed with the mechanics of give and take that any consequences of the exchange become irrelevant. People betray other people in Les Espions; they collude, they lie, they kill. No one’s motivations are clear—not even Malic’s, except on an emotional level. He is a moralist and a romantic. He has wound himself up in a grand narrative, which must conclude—be sewn up—so that all torments are justified. When it seems no righteous conclusion can be found, Malic longs to leave the deal, but the doctor can’t just do that, can he? Nor, in a sense, can the director. 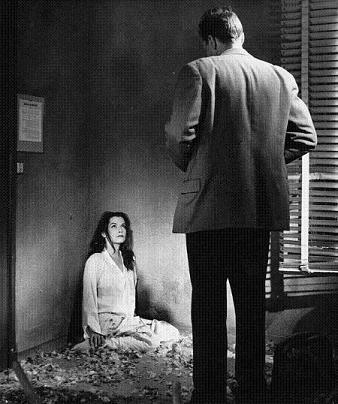 After tethering us for two hours to a man we neither respect nor fully understand, in the end, Clouzot puts us in the same boat with him. We believe no one; we assess the claims of the various characters and conclude that none is more trustworthy than the others. Minor parts, like the alcoholic, or a taxi driver who comes and goes one night, could be the lynchpin of everything. Even Lucie could be a plant. We lack the information to be sure. We need more information. Les Espions could go on and on like this—could last for years, ending only when every player is dead. The only other way to stop it, for any of the men and women in it, is to simply decide to trust. Not to question, not to attempt to out-maneuver—just to accept what one is told, and try to live life. What madness, that. Les Espions (The Spies) screens, Thursday, November 24, at Toronto’s TIFF Bell Lightbox—part of the retrospective The Wages of Fear: The Films of Henri-Georges Clouzot. Click to read my posts on Clouzot films The Wages of Fear, Le Corbeau, and Diabolique.